This paper investigates potential avenues of encouraging the United States and Canada (federal and local governments as well as their business and NGO communities) to consider building in stages a Bering Strait tunnel, connecting Alaska and Russia. 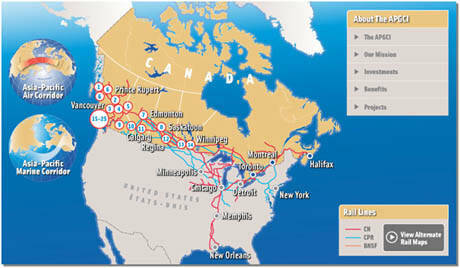 Given that a significant government-funded phase one feasibility study in 2007 found a supportive business case for an Alaska-Canada Rail Link (ACRL) that would connect existing Canadian rail lines in British Columbia with the Alaska Railroad, the author argues that, ideally, an ACRL ought to be promoted as the first stage toward eventually building a Bering Strait crossing. 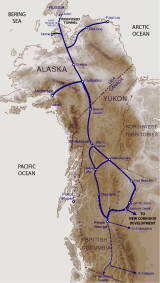 Once an Alaska-Canada rail link were built, it would possibly be easier for public or private sector consideration of extension of the North American rail link from Fairbanks, Alaska to the Nome vicinity (stage two), and ultimately, to construct a tunnel to connect to Russia (stage three). However, with the business climate in western Canada now dominated by Alberta's increased crude oil production that seeks new markets, an eventual ACRL would have to secure funding through private investment, not public funding. Given present indifference to an ACRL in North America, although it might be problematic politically, it may be a viable option to invite Chinese private investment in an ACRL. Nonetheless, ACRL construction may have to wait until several smaller-scale transportation projects are built in Alaska that will help substantiate a business case for an ACRL. On the governmental level, the project needs to be promoted strategically as a means to strengthen U.S.-Russian relations over the long-term, as well as to boost cultural ties between North America and Eurasia. A near-term recommendation is that a project office be established in Anchorage to educate and lobby Alaska's executive and legislative branches, relevant state agencies, business and non-profit associations, Alaska native corporations, and local media for this project. It should build a base of awareness and support, including gathering a coalition of like-minded organizations and relevant state agencies. The author also recommends the Bering Strait project be cast in the broader framework of emerging U.S. policy for the Arctic region. Finally, another near-term recommendation is offered for portraying the Being Strait project as a means to reconnect the indigenous peoples of Eurasia and the Americas. Building a Bering Strait tunnel with lengthy connecting railways in North America and Eurasia will require the political and financial support from within the three nations whose territory the project will traverse: the United States, Canada, and Russia (China is arguably the fourth nation whose financing and labor may be essential for undertaking this project on the Eurasian side). This paper makes recommendations how to promote and advance this project within the U.S. and Canada, with a focus on the State of Alaska, as well as British Columbia, Alberta, and the Yukon territory. It also discusses serious impediments in the current political and economic climate toward constructing the first stage of a Bering Strait project: the connection of the rail lines between Alaska and British Columbia. The U.S. and Canada, as democracies, will require a multifaceted approach that utilizes effective and sustained education and lobbying in the public and and private sector to build support, obtain financing and governmental approvals for this project to succeed. The idea of a Bering Strait crossing originated when Colorado's first territorial governor, William Gilpin, proposed a rail link in 1849 (allegedly, President Lincoln believed in a railroad crossing under the Bering Strait; Alaska was purchased from Russia by the U.S. two years after his death). The concept was revived in the late 1890s by E. H. Harriman of the Union Pacific Railroad, part of a vision to unite the rail networks of the Americas, Asia and Europe. By 1906, a consortium of Americans, French and Russians established a well-funded New Jersey corporation specifically for construction of a Bering Strait tunnel. But in 1907, the Russian Czar - two years after Russia's defeat in the Russo-Japanese War - declined to grant a concession for construction. The most recent expression of interest in a Bering Strait crossing came from the Rev. Dr. Sun Myung Moon, founder of the Universal Peace Federation, beginning in June 2005. He tapped into much of the early idealism of connecting the infrastructure of the continents, but took it much further. He termed the early 21st century a "historic opportunity" to bridge the barriers between races, cultures, religions and nations through the construction of a Bering Strait bridge and/or tunnel that could potentially link the Cape of Good Hope to Santiago, Chile, and Tokyo to London. He named his Bering Strait proposal the "World Peace King Tunnel," an 85-kilometer, $200 billion link connecting East and West, the Americas and Eurasia. In his vision, the ready movement of people, not only products, around the world is essential to advancing global peace and shared prosperity. A Bering Strait tunnel directly impacts the United States, Canada and Russia, and indirectly their neighbors, China, Mongolia, the two Koreas, Japan, and even Mexico/Central America. Construction of a Bering Strait tunnel accompanied by extension of American-Canadian and Russian rail lines would have a dramatic impact on future economic development in eastern Siberia, Alaska and the Canadian northwest, somewhat akin to the Transcontinental Railroad in the American West in the mid-19th century. 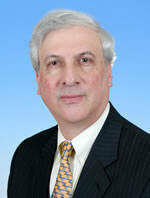 Such a project would also serve to solidify U.S.-Russian relations over the long-term and expand bilateral cooperation. China, as well, stands to be a primary beneficiary, as both its finance and labor would be important, if not vital, for the project. First, West Coast American and Canadian ports are highly congested, and a rail link to Eurasia would not only reduce that congestion but vastly increase North American-Eurasian trade. Secondly, completed rail links across Alaska and through the Canadian West, connecting to the Lower 48 U.S. states, would have a highly beneficial impact on Alaska, western Canada, and the U.S. Pacific Northwest. Thirdly, eastern Siberia, one of the most resource-rich regions of the world, is exceedingly under-populated; constructing rail from the Trans-Siberian Railway (TSR) or from Yakutsk to the Bering Strait would invigorate (and populate) this region. 1. The tunnel would connect several continents, even hemispheres, not just two islands or an island with the mainland: North and South America (the Americas or Western Hemisphere) with Europe and Asia (Eurasia). This is far more significant than connecting Europe with an island which was very accessible without the Channel tunnel (much of the debate over the Chunnel was more about keeping Britain separate from Europe rather than the economics of the project). Thus, the frequently-made Chunnel comparison is in fact not very relevant. 2. The requirement for the extensive infrastructure to access a Bering Strait tunnel from both continents exists no matter what, but creation of access routes to the tunnel also serves to open the currently isolated areas of the far north of North America and the Russian Far East. The alternative is no access and no development, which - over the long run - is not economically appealing. 3. More importantly, the tunnel must be viewed as a passage point between the continents, rather than merely a means of local development for areas with small populations. The tunnel would create the linkage of a vast interior transport network that would make possible commercial (including passenger) rail transport from cities such as Chicago, New York, Los Angeles, and Mexico City to Moscow, Beijing, Mumbai, Berlin, Paris, London, etc. 4. A Bering Strait rail tunnel would have to compete against the alternatives, mainly, ocean-going shipping. Yet, there are countries and vast regions which are far from any ports but could have direct rail access to North America via a Bering Strait crossing. In the end, a great deal of economic stimulus over the long run would result from that. The Alaska natural gas pipeline, supported by Alaska's present governor, Sean Parnell, and two previous governors, Sarah Palin and Frank Murkowski, is a proposal to transport natural gas from Alaskan North Slope natural gas reserves through Canada to the U.S. Midwest. There are two competing projects: one by BP and ConocoPhillips Alaska called "Denali," the other by TransCanada Corp. and ExxonMobil. TransCanada has secured state seed money and a license from Alaska to build and operate a pipeline, but does not yet have federal approvals needed to start construction. Denali is spending its own money to move the project forward. Since 2009, TransCanada has partnered with ExxonMobil on a joint pipeline proposal. Building a railway alongside an Alaska gas pipeline would make good economic sense. The Canadian pipeline company which owns the pre-permitted route through Canada claimed that the cost of building the natural gas pipeline without a rail connection along the route will be more than $4 billion (which must be spent to upgrade the Alaska Highway, and developing trucks that can carry the 52 inch pipes to the site). But the gas line builders know that if they had to build a railroad as well, it would cause additional delays (e.g., for more environmental impact statements) and they want the project to be approved as swiftly as possible. According to estimates, a railroad could save gas line builders $1 billion in costs of the $25 billion estimate to build a gas line. The bottom line is the Alaska natural gas pipeline, if undertaken, would not wait for a railroad; in fact, the window of opportunity for the co-mingling of these projects likely already passed. Moreover, proposed federal regulations regarding climate change could make the Alaska natural gas pipeline uneconomic, according to Governor Parnell. And currently, as will be seen below, the dominant discussion in the region now is how Alberta can get its oil to market, which involves possibly building additional oil pipelines, but not rail, and which is having the effect of putting the Alaska gas pipeline project on hold (because the oil is already available, despite the fact that gas helps harvest Alberta's oil). Many say the gas pipeline eventually will be built, but not for at least ten years. Meanwhile, a highly significant study, Rails to Resources to Ports,  published in 2007 by the State of Alaska and the Canadian territory of the Yukon, concluded that an Alaska Canada Rail Link (ACRL), connecting Alaska and northern British Columbia, would create wider benefits even if freight revenue did not cover the projected $10.5 billion construction cost. Building up to a 1,600 mile line(s) between existing railroads in Alaska and Canada would spur mining development and open a new trade route to Asia. The report suggested the rail link would likely have to be funded as a joint public-private project, as projected freight shipping revenues over 50 years would cover only about 75 percent of the full investment. Building the rail line through this largely wilderness region would create $11.4 billion in net public benefits such as increased employment over the next five decades. In 2000, the U.S. Congress authorized $6 million to study the feasibility of the idea. The 2007 ACRL study examined building a line from a terminus of the Canadian National Railway in northern British Columbia, running through Yukon to the state-owned Alaska Railway, as well as a branch line to the White Pass & Yukon Route Railway. Rail cars to and from Alaska now travel by barge, thus building the rail line would improve the state's economic security by adding transportation options, the researchers said. 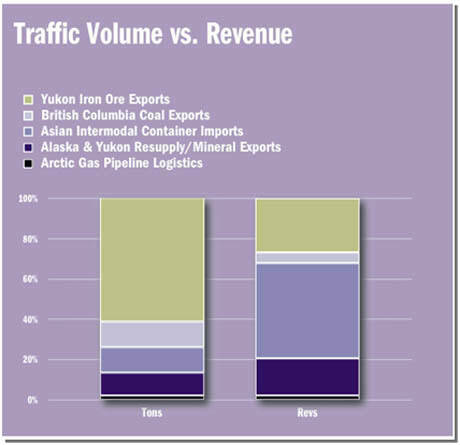 Exports of British Columbia coal and iron ore from Yukon would probably make up the bulk of the line's freight traffic because access to rail service would make building mines in the region more economically feasible. Asian trade via containers could also become a revenue source. The economic research used to prepare the report was much more extensive than any earlier study on an Alaska-Canada rail link. The researchers acknowledged the line would also have an environmental and social impact on the wilderness area, and said both issues needed more study. 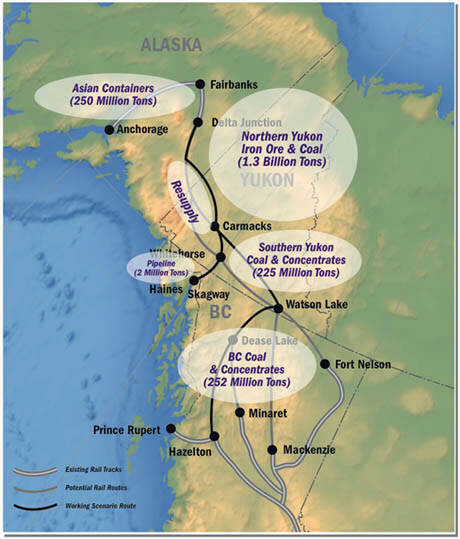 The Rails to Resources to Ports report proposes rail links to ports in Alaska, Yukon and/or British Columbia to then ship North American mineral resources across the Pacific to China, South Korea and Japan, and to receive container traffic in return. It does not propose -- or even mention -- a rail link across the Bering Strait. Instead, it recommends in effect a "rails to ports" solution to enable access to markets for the mineral wealth of northwestern Canada and Alaska. Of course, beyond the economic advantages, there are clear strategic, political, and cultural benefits for a Bering Strait rail route. Nonetheless, ideally, building an Alaska Canada rail link for its own sake should be strongly encouraged because it would become the foundation on the North American side for an eventual Bering Strait tunnel. While advocates of an Alaska Canada rail link do not have a Bering Strait crossing in mind, building connecting track from the Lower 48 to the existing Alaska Railway, with its current northern terminus in Fairbanks (and eastward extension to Delta Junction), accomplishes a vital leg of the necessary North American infrastructure for a Bering Strait crossing. Other than the grand project of building the tunnel, which would necessarily be a U.S.-Russian joint venture, Alaska would also need to lay about 600 miles of track from Fairbanks to Nome (or Wales), on the westernmost Seward Peninsula. Although a huge rail project in itself, there ought to be considerably more incentive if the Alaska Canada rail link were already built. 3. Construction of a tunnel underneath the Bering Strait connecting to Cape Dezhnev in Russia. Once an Alaska Canada rail link is made, the longest stretch of infrastructure toward the Bering Strait would be built, making a Bering Strait tunnel and the additional required track to Fairbanks that much less daunting to complete. Indeed, early use of a completed Alaska Canada Rail Link would give clues to how much more attractive a land route to Asia would be versus a sea route from off-loaded rail freight embarking from Anchorage or another northern port. An additional incentive for an ACRL are the restrictions on shipping between Alaska and the Lower 48 states by the federal Jones Act, which prohibits "cabotage" (sailing from one U.S. port to another to deliver freight or passengers) by foreign vessels. The Jones Act prohibits foreign-built ships and crews from engaging in trade from port to port in the United States, although rare exemptions are granted. Intracoastal shipping from Alaska to U.S. West Coast ports is overall uneconomical and costly because it requires American vessels and crews for domestic shipping. For this reason, at a 2005 conference, then Governor of Alaska Frank Murkowski strongly promoted connecting Alaska to the Lower 48 by a rail corridor through Canada because it is politically impossible (due to opposition of maritime labor unions) for Congress to modify the Jones Act. ► The key business issue now is getting western Canada's mineral wealth to tidewater (or market). In that context, an Alaska Canada Rail Link per se is not considered to offer a realistic solution. For example, there are large zinc deposits in Yukon. Some argue that British Columbia should not connect rail to Alaska but rather to these zinc deposits. ► The present assessment is that the role of government in the U.S. or Canada in building a rail link between Alaska and Canada, whether state, provincial or federal, would be limited to right of way issues, but not involve the provision of grants, loans or subsidies. According to one observer, there is no public support for even a mile of new track in the U.S. The sobering conclusion is that an ACRL may only eventually be built with private funding. ► The big story right now in western Canada is Alberta's oil sands. Alberta has the second largest oil reserves in the world after Saudi Arabia, although they are more difficult to recover. Over the next ten years, Alberta is doubling its oil production and needs to get its oil to market. The most logical nation would be the United States, but after 2010's BP oil spill in the Gulf of Mexico, environmental groups have pressured Congress to not permit extending an oil pipeline from Alberta to the Gulf Coast, despite the fact this would reduce American dependency on Middle East and Venezuelan oil by supplying up to 25% of U.S. oil needs. Therefore, Alberta is considering having Enbridge, Inc., construct two pipelines to Kitimat, British Columbia, one to export crude oil to Asia, the other to transport natural gas (used to harvest oil sands). However, again, environmental groups, alarmed by the BP oil disaster in the Gulf and fearing a potential spill in the waters by Prince Rupert, have pressured the Canadian government not to approve this pipeline. ► The decades-old Alaska Oil Pipeline, extending from Prudhoe Bay to the port of Valdez, is now running at one-third capacity, at a time when the Obama administration has put what some allege is a de facto moratorium on the exploration of new oil resources along the U.S. continental shelf. The oil pipeline, run by BP, may have to shut down when it approaches its minimum operating capacity. Several Canadian First Nations (indigenous peoples) in Alberta have proposed filling the Alaska Oil Pipeline with Alberta crude oil, and advocate a rail connection from northern Alberta to Prudhoe Bay to transport it. Although there are certain technical factors in favor of transporting Alberta crude to the Alaska Oil Pipeline, British Columbia, through which such track would have to run, opposes this idea. However, Yukon, essentially landlocked between Alaska and British Columbia, is anxious for a rail link to the rest of Canada and Alaska in order to jumpstart its economic development. Therefore, it is safe to conclude that the next decade will be a difficult time for either the U.S. or Canada to seriously consider connecting Alaska and British Columbia by rail, given that the dominant economic issue is Alberta's increased crude oil production connecting to long-term markets. It seeks to diversify its markets and bring its "bitumen" (oil sands oil) or initially-refined synthetic crude oil to tidewater. Entering the global market gives Alberta greater flexibility, perhaps a higher price, and does not make it captive to U.S. environmental interests who are critical of its operations; Alberta does not want to be locked into one foreign market. In this context, an ACRL would have to serve this purpose, yet most political leaders in western Canada and the American Pacific Northwest do not see a convincing business case for it. The global economy still revolves around oil, and in this climate, it is difficult to make a business case for a project whose benefits would be more long-term, and may not be able to pay for itself. Moreover, Alaska has substantial known but untapped oil and gas deposits in the Beaufort and Chukchi Seas, while north central Alaska has some of the most abundant coal reserves in the world. Although Alaskans may prefer to sell their crude oil domestically, development of its coal reserves would require significant infrastructure, including rail, and China could become the primary customer. Given the extent of mineral resources in northwestern North America, there may be a substantial business case for Chinese firms to invest in the building of an ACRL if that could help meet China's future energy needs. Chinese investment in rail infrastructure in northwestern North America might be politically problematic, but China in fact may be the most realistic investor at this time. In order to guarantee China's long-term access to crucial mineral resources, such as crude oil, coal and zinc, Chinese firms (most state-owned) may well conclude it is in China's interest to provide primary funding for building an ACRL. Such a decision could turn out to be of mutual benefit to the U.S. and Canada as well. 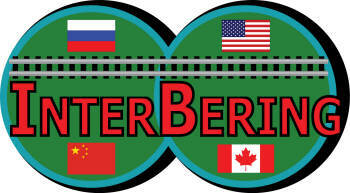 Moreover, looking ahead, the eventual construction of a Russian rail link to the Bering Strait, though traversing Russian territory, is likely to be substantially financed by China and built by Chinese labor because it has the most to benefit from the project. China's investments in Latin America and Africa are very aggressive and steadily mounting; that the investments may not pay for themselves for 10-20 years is not a major concern for China. A project that would open up access to the vast reserves of natural resources in Alaska and northwest Canada (as well as the Russian northeast) is something China will have to consider very seriously. Perhaps, a low-key private effort to contact relevant Chinese state-owned firms is needed to explore the possibility of Chinese investment in an ACRL, even though that would be in addition to present Chinese investments to bring coal and crude oil to its shores from the Pacific coasts of the U.S. and Canada. Meanwhile, ACRL construction - by anyone - will likely have to wait until a number of smaller-scale transportation projects are built in Alaska which collectively will help point out the need for an ACRL. This will be amplified in the section on lobbying in North America. Aside from building an ACRL, which would be the foundational stage, stages two and three of creating a Bering Strait crossing really involve Russia. Frankly, there is no reason to lay track in Alaska between Fairbanks and Nome unless there is clear intent to connect to the Russian rail system. Privately, one senior Alaskan political leader admitted he supports eventually building a Bering Strait tunnel, but unless Russia and other countries (e.g., China, South Korea, Canada) clamor for it, the American side will never act on its own. Without clear-cut demonstrations of international support and even insistence, from the American point-of-view this project will remain a pipe dream. 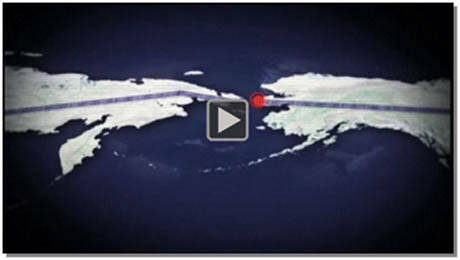 Since 2007, Russia has expressed noticeable interest in a Bering Strait tunnel according to press reports. In fact, in the lead up to recent G8 and G20 summits, the Russian news services have speculated that the project would be on the summit agenda. Even though that did not occur, one may presume that behind the scenes Russian delegates broached this subject with Chinese, Canadian, American and other attendees. While the degree of Russia's professed interest may vary depending on the current world economy, the country that will most influence the U.S. to begin to take the project seriously is Russia. Perhaps a sustained Russian effort to lobby the American political leadership over a decade or more will ultimately bear fruit, especially if world economic and political conditions become more stable. Of course, over such a period, U.S.-Russian relations must greatly improve -- and definitely not sour. Once the Americans realize the Russians are indeed serious, and consistently so over several Russian administrations, then the U.S. will get the message that it cannot afford to ignore this project. Not to be underestimated are the national security implications of creating a Bering Strait project. A great deal of the strategic and military policy of each nation toward the other will have to be modified and updated to reflect a higher level of trust that will be a prerequisite to commencing this project. More immediately, the maritime boundary between Russia and the U.S. in the Arctic is still not agreed upon, despite an exchange of diplomatic notes with the Soviet Union in 1990. This will have to be settled well before consideration of a Bering Strait tunnel. The Bering Strait project must be seen by both Russia and the U.S. (as well as Canada and China) as an historic task that will cement their ties for the long-term, and bridge not only former adversaries but entire continents and hemispheres. It should be seen as a great global task of permanent peace-building. For international and strategic reasons, a sustained lobbying effort in Washington, DC, and Ottawa eventually will be necessary, but at present any effort in either capital would probably not make much difference. Promoting critical components of a Bering Strait crossing, such as an Alaska Canada Rail Link, will have to be a private sector-led effort, and the farther away from the Pacific Northwest you are, the less awareness and interest there is in this railroad. An ACRL will have to first garner widespread support from Alaska, Yukon, and Alberta, which in the long run will be much more effective. A high profile and costly Washington, DC, lobbying office is not relevant or needed at this stage. Congress will move only when the private interests are on board and jobs are quantified. This support will only happen from the ground up -- from Alaska to Washington, DC (and from western Canada to Ottawa), and not the other way around. Regional support, in both the private and public sectors, for an ACRL must be very strong over a sustained period in order to get Congress's attention. Instead, this author recommends opening an Anchorage office that could be in the form of an economic development or business leadership forum focused on statewide transportation projects, including those that could link Alaska to other nations, whether Canada, Russia or East Asia. The key would be to build partnerships with the relevant stakeholders in major Alaskan transportation projects, including large corporations (like oil companies), mid-sized businesses, state agencies, federal agencies, Alaskan native corporations, local NGOs, and local media. 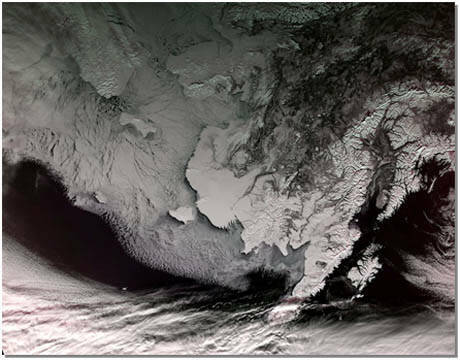 The office's work would also take it to other Alaskan cities, such as Juneau, Fairbanks, Skagway, as well as to Whitehorse, Yukon, and perhaps elsewhere in western Canada. ► Private (local and regional, as well as national) NGOs should push for this project. 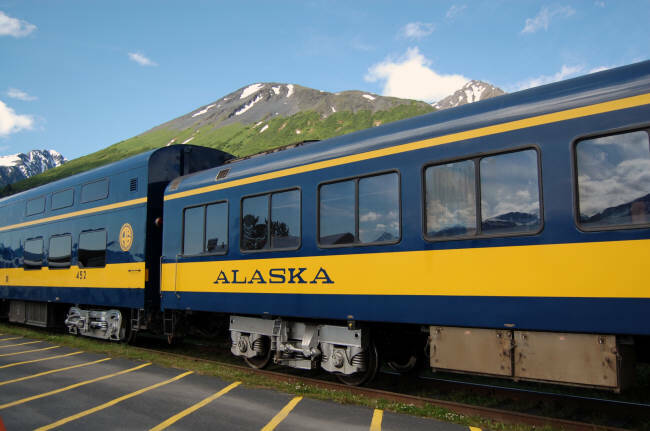 ► Alaska should take the legislative steps to reserve rights of way along the rail route. ■ Skagway Port. With road, marine and air access, Skagway - the northernmost ice-free deep-water port in North America -- is well positioned to be the major transshipment hub for Southeast Alaska and the Yukon. With new efforts to expand these links, Skagway now offers opportunities to the West Coast, Pacific Rim, and South Asia. It is one of three communities in Southeast Alaska with road access to the Lower 48 states and to Canada, a distinct advantage for any business that requires access to outside markets. The Klondike Highway meets the Alaska Highway 100 miles away and is maintained and open year round. ■ Ambler Road -- a road to a major mining district in Alaska that the state is studying to build. ■ Road to Nome (a $3 billion 500-mile gravel road Alaska's Governor is proposing to build to connect the Fairbanks area with Nome). This route could be a forerunner for rail over the same course. ■ The development of Russian rail to Yakutsk and beyond, which is eventually intended to terminate by the Bering Strait (also, Alaska should maintain and build good relations with Russian counterparts). ■ The increasing use of aircraft and even blimps to connect towns and villages throughout Alaska. ► Envision and find a cargo that could pay the bill for an ACRL and a Bering Strait tunnel. 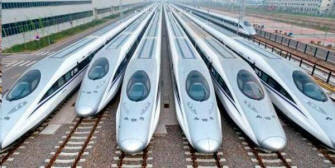 ► Look for new technologies to build rail and run railroads, as well as to build tunnels, that could reduce costs. ► Overall, let the smaller steps add up over time, especially the coming decade, and they will likely coalesce into larger steps. This is especially true in Alaska. Given the position of this individual in Alaskan state government, these suggestions should be seen as very practical and achievable in building both a base of support for an Alaska Canada rail link and an eventual Bering Strait tunnel. Those nations above the Arctic Circle are the U.S., Canada, Russia, Norway, Sweden, Finland, Iceland, and Denmark (by virtue of Greenland). U.S. strategic thinking on the Arctic culminated late in the presidency of George W. Bush, when in January 2009, his administration released National Security Presidential Directive 66 (NSPD 66), which established a new U.S. policy for the Arctic region. According to a Washington think tank report on U.S. Arctic policy, "the directive addressed 'soft' security issues of governance, continental shelf and boundary issues, scientific cooperation, maritime transportation, economic issues (including energy), as well as environmental protection and conservation. The traditional 'hard' security interests included both national and homeland security concerns vis-à-vis the Arctic. These include the fundamental interest of the United States in 'missile defense and early warning; deployment of sea and air systems for strategic sealift, strategic deterrence, maritime presence, and maritime security operations; and ensuring the freedom of navigation and oversight.'" The Presidential Directive outlines a strategy that requires "the United States to assert a more active and influential national presence to protect its Arctic interests and to project sea power throughout the region." As the summer ice retreats, opportunities for commerce, tourism and transportation advance. Already we see more mineral, oil and gas exploration - more vessel traffic and science missions. As we have seen throughout the world's oceans, increased maritime traffic elevates both risks and threats... We need the federal government to step in. We can no longer assume that the threat from the north to our oil production fields is not real. We can no longer assume that the Arctic is an impenetrable barrier. The United States must increase national focus on the Arctic, add resources to collect scientific data, and increase Coast Guard presence to address these new challenges and opportunities. This will provide the ability to develop the American Arctic's vast natural resources and is critical for the protection of strategic national infrastructure and assets. There is no doubt that a Bering Strait project, beginning with construction of an Alaska Canada rail link, in part, can be portrayed as an enhancement of the Arctic policies of the United States and Canada. Certainly, there are serious national security implications to a Bering Strait tunnel for both the U.S. and Canada. Their Arctic policies are concerned with sovereignty and security, but also with economic development and well-being for the regions indigenous inhabitants. The Arctic region of North America and those who live in it stand to benefit from this project if a partnership is made with them from the beginning. The environmental, economic and social impact of these rail and tunnel projects will certainly be studied carefully, and those who live near this project in Alaska and Canada must not be sidelined or forgotten. Most can agree that a Bering Strait tunnel with the necessary infrastructure in North America and Eurasia is a project that could be 40-50 years off or more. Many who are aware of the project agree it is a good idea, but, because of the effort and costs involved, not to mention international cooperation required, believe it will not happen in their lifetimes. However, a recommendation is offered that could be accomplished this year. There is a common ancestral link between the indigenous peoples of Siberia and Russian Far East, Mongolia, China, Korea, Japan, and the indigenous peoples of all of the Americas. It was the Bering Strait Land Bridge that made possible the migration of these Asian peoples to the Western Hemisphere millennia ago. Why not declare in 2011 that a new Bering Strait Land Bridge will be built in the future and make such an announcement with gathered indigenous peoples from both sides of the Strait? A small conference about the cultural and peace importance of the Bering Strait crossing project could be held in summer 2011 in Alaska, called together by the founder of the Universal Peace Federation, Rev. Sun Myung Moon. Representative attendees would come from the East Asian nations of China, Korea, Japan, and Mongolia. and from indigenous peoples from the Russian Far East, as well as from Alaska, Canada and the Lower 48 states, even Mexico. At the meeting, it would be announced that through the Bering Strait project, "we are restoring the land bridge between Eurasia and the Americas that will revive our common heritage," and that "the land bridge will rejoin us." 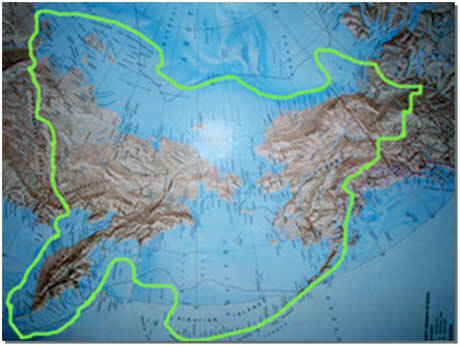 While the conference itself could be held in Kodiak or Anchorage, the participants could then fly to Wales, Nome, or other suitable location near the Strait. There, a photo of the attendees with Rev. Moon gathered near the site of a future tunnel could be taken to memorialize the occasion, which will be a historic photo in 50 years time. After all, the argument for a Bering Strait tunnel is not ultimately economic or political, but cultural and based on its value in peacebuilding. Perhaps, Rev. Moon could call for such a meeting in Alaska this summer so that history will record this momentous occasion. This paper argues that construction and completion of an Alaska Canada rail link (ACRL) will accomplish the foundational stage for a Bering Strait tunnel so that momentum would be created for serious consideration of construction of a Fairbanks to Wales rail link, and ultimately for the building of a tunnel in cooperation with Russia. Although the 2007 phase one feasibility study for an ACRL recommended track terminating at ports in Alaska and western Canada for ocean shipping of goods to Asia, not continuing a rail link to the Seward Peninsula, the idea of a Bering Strait tunnel may seem more feasible once the largest segment of required rail infrastructure is built connecting the Lower 48 through Canada to Fairbanks. Unfortunately, in today's economic climate in western Canada, with the focus on getting Alberta's crude oil to tidewater, as well as with America's moratorium on offshore oil exploration, a persuasive business case for an ACRL has yet to be made. Clearly, no ACRL can be built unless major private funding is secured, as the era of mega projects sponsored by the U.S. federal government is long gone. We cannot think in terms of massive public (or public/private) projects such as the Trans Continental Railroad in the 19th century (which was ultimately privately funded as all government loans were repaid by the railroads), the Tennessee Valley Authority of the 1930s (still a federally-owned corporation), or even Ronald Reagan's Strategic Defense Initiative (SDI) of the 1980s (which neither was that large a project nor did it see much technological success). The American government cannot and will not take upon itself the burden of building a project of the magnitude of a Bering Strait tunnel. If we are patient, the economic climate may change in ten years, and perhaps private funding for an ACRL will then coalesce. Or, perhaps the Chinese should be persuaded to be the primary investors in a project far from its shores but for whom they will be the primary beneficiaries, but potential downsides to Chinese investment have to be assessed. 1. 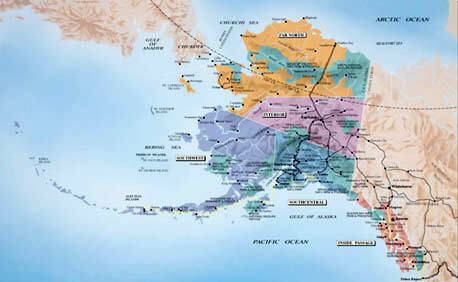 Open a Bering Strait project office in Anchorage, Alaska, which would initially take the form of an economic development or business leadership forum, focused on statewide transportation projects, including those that could link Alaska to other nations, whether Canada, Russia or East Asia. The focus would be to build partnerships with the relevant stakeholders in major Alaskan transportation projects, including large and mid-sized businesses, state agencies, federal agencies, Alaskan native corporations, local NGOs, and local media. Eventually, this regional support in Alaska will impact western Canada, and in turn resonate in Washington, DC, and Ottawa. 2. A private effort perhaps can be made to determine, in a preliminary way, Chinese (state-owned) business interest in investing in an Alaska Canada rail link, and, in turn, an eventual Bering Strait project. 3. The American and Russian governments need to settle their Arctic boundary dispute because it affects the Bering Strait region. Moreover, sustained Russian insistence on this project is necessary in order to have Washington pay attention. 4. A small conference of indigenous peoples from both sides of the Bering Strait could be convened in Alaska as early as this year as a way of signifying the importance of reconnecting the peoples from Eurasia and the Americas by constructing a Bering Strait tunnel. Note: The views expressed in this paper are solely those of the author and do not necessarily reflect the views of the Summit Council for World Peace. Cf. 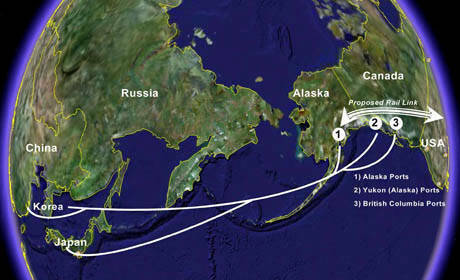 Richard Freeman, "Origins of the Bering Strait Project," Executive Intelligence Review, May 4, 2007, pp. 41-42. However, Freeman's chronology needs corroboration. Rev. Sun Myung Moon, "God's Peace Kingdom Is the Eternal Homeland for All Blessed Families," Address given June 26, 2005, Washington, DC, p. 8. The author credits "Bogtalk" for his/her useful comments posted on the Google Earth Community web site on November 17, 2005 regarding the feasibility of an intercontinental peace bridge across the Bering Strait, which this author has adapted. "Alaska Railroad Corporation--Petition for Exemption--To Construct and Operate a Rail Line Between North Pole, Alaska and Delta Junction in Alaska," Federal Register, April 3, 2008, p. 18323. Comment made to an Alaskan proponent of the Bering Strait project later interviewed by this author. Heather Conley, and Jamie Kraut, U.S. Strategic Interests in the Arctic: An Assessment of Current Challenges and New Opportunities for Cooperation, Center for International and Strategic Studies, April 2010, p. 8. Sean Parnell, "The Strategic Importance of the Arctic in U.S. Policy," testimony by the Governor of Alaska before the Subcommittee on Homeland Security, Senate Appropriations Committee, Anchorage, AK, August 20, 2009. Government of Canada, Statement on Canada's Arctic Foreign Policy: Exercising Sovereignty and Promoting Canada's Northern Strategy Abroad, August 2010, p. 11. "What is Beringia?" National Park Service web site (www.nps.gov/bela/historyculture/beringia.htm); also see "Beringia," Wikipedia. The author credits a well-placed observer of the Pacific Northwest for this specific recommendation. Screen shot from the Discovery Channel video, Mega Engineering: Building a Transcontinental Tunnel (2009). 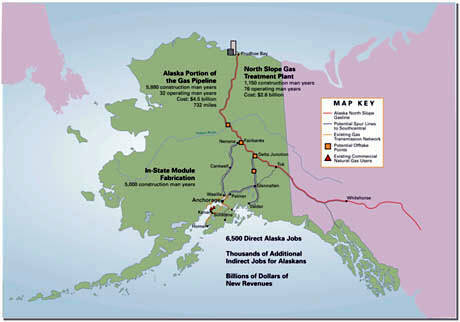 A map of the proposed Alaska Natural Gas Pipeline.